Califfo - 7 e mezzo - Sei pronto a sfidare il Califfo alias Franco Califano ? 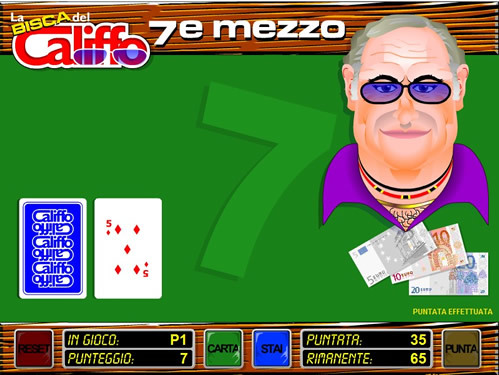 Gioca a 7½ con il Califfo, lo scopo del gioco è arrivare a 7 e mezzo con le carte. Ricorda che le figure valgono mezzo punto. Buon Divertimento !!! 7½ Italian Game - Are you ready to challenge the Caliph alias Franco Califano ? Play to 7 ½ with the Caliph, the goal of the game is to arrive at 7½ with the cards. Remember that the some cards are worth half a point. Have Fun !! !